The National Equal Justice Library (NEJL) is a collection dedicated to documenting and preserving the legal profession's history of providing counsel for those unable to afford it. The concept of creating a library specializing in legal aid was introduced in 1988 by Justice Earl Johnson, Jr., a judge on the California Court of Appeals, at a meeting of the Board of the National Legal Aid Defender Association (NLADA). Four major organizations — the American Bar Association (ABA), the National Legal Aid and Defender Association (NLADA), the Association of American Law Schools (AALS), and the American Association of Law Libraries (AALL) — then worked together to form a non-profit corporation, the Consortium for the National Equal Justice Library, Inc. (CNEJL), which met for the first time on October 21, 1989. The importance of such a collection is illustrated by the unfortunate destruction of the papers of Clara Shortridge Foltz, who was the first woman lawyer in the western United States, and who is credited with founding the public defender system in the United States. The NEJL is a repository dedicated to preserving collections with historical significance from this fate. One of the significant collections in the National Equal Justice Library is the Oral History Collection. The oral history project was established in 1990 and the first set of interviews were conducted between 1991 and 2005. 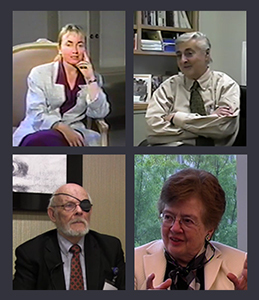 A new series of oral history interviews was begun in 2013, and is ongoing.